However, On July 17 2018, the Design Museum in London hosted an event held by Leonardo, one of the biggest arms companies in the world. The event was held as part of the Farnborough International arms fair. 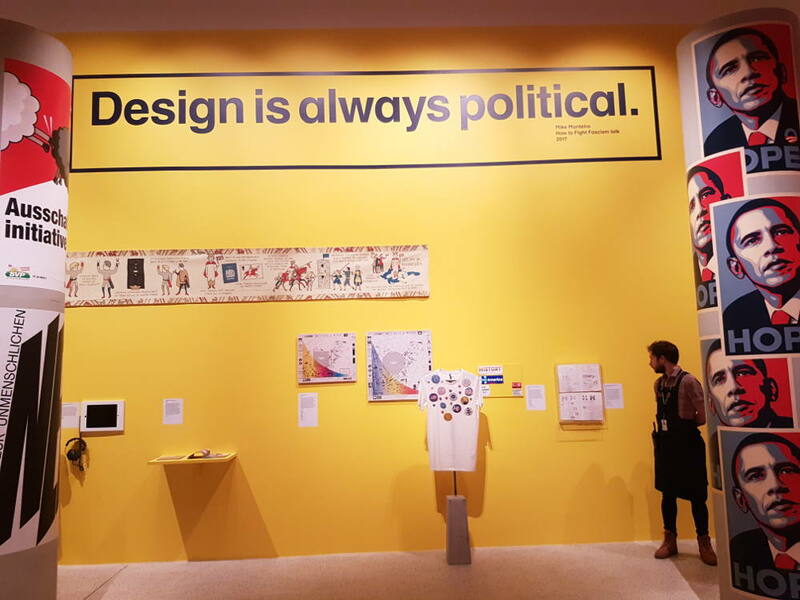 Whilst in another part of the museum, there was the exhibition ‘Hope to Nope’ exploring the role graphic design and technology has played in the big political events of the past 10 years. 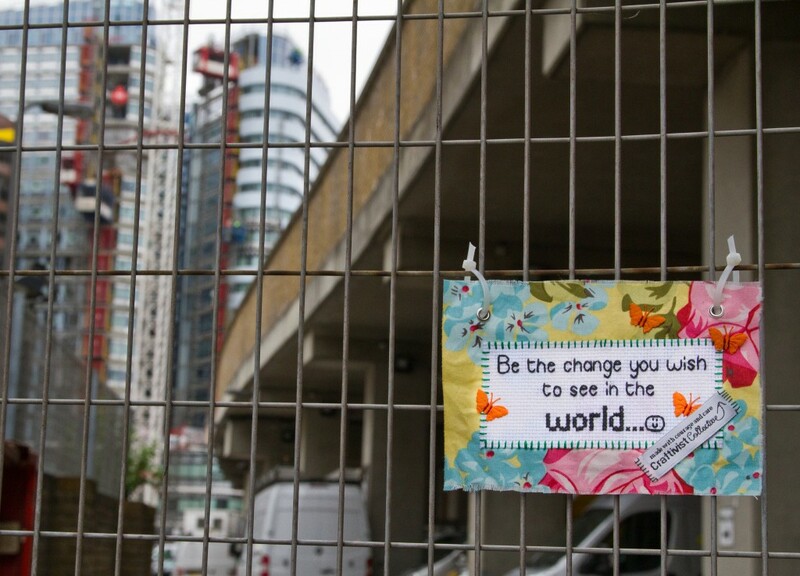 This doesn’t sit well with our Craftivist Collective values. I am shocked by this as the Design Museum provides such an important public service. Museums need to make ends meet, but surely this is not the right way to do it. I hope our stand encourages the Museum to adopt an ethical funding policy as a matter of urgency. 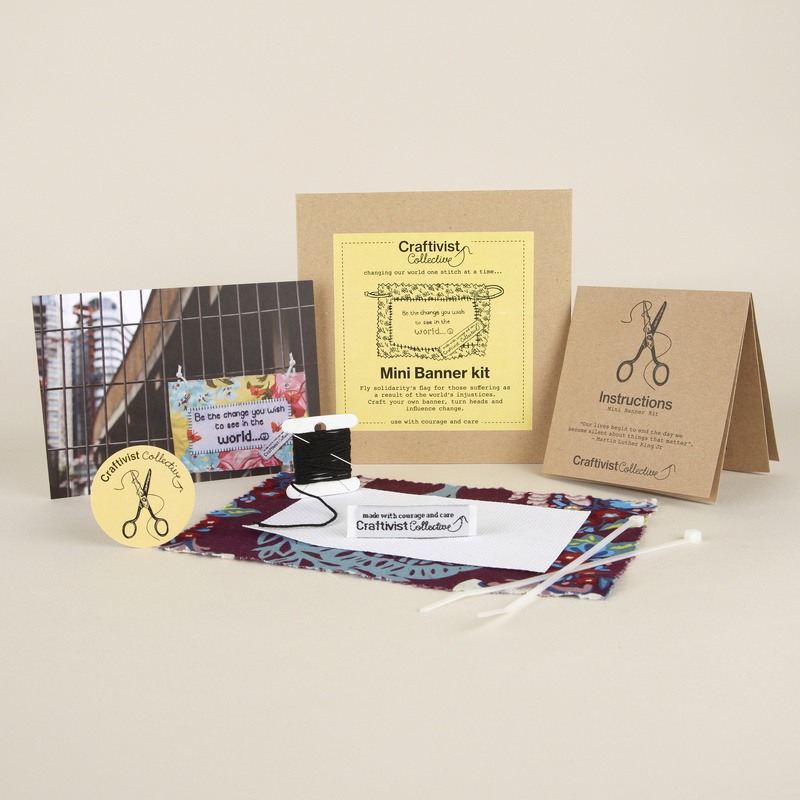 I have asked them to stop selling my craftivism DIY kits until such a policy is in place. Back in March When members of BP or not BP? attended the opening of Hope to Nope to see their anti-oil-sponsorship Shakespearean ruff on display, the museum’s Chair of Trustees Peter Mandelson was asked the museum has an ethical fundraising policy in place. He seemed unconcerned. The actor-vists called on the museum to engage in the ethical sponsorship discussion and update its policies. So far they have not received any reply from the museum so… we now need to go public to progress. Therefore, today we the Craftivist Collective have joined a public stand with 25 artists, designers and activists, whose work is currently being exhibited in the Museum and written to the Design Museum asking for our work be removed from the current Hope to Nope exhibition. We haven’t made a demand to the Design Museum – its an invitation and opportunity for the staff to reflect on its values, improve its policies and be part of a growing movement that says no to arms, oil and tobacco money being part of our museums. We hope our letter is a catalyst for open and respectful conversation to help them update their policies. Design is indeed political and as a lecturer in design I fully support this letter and your stance.